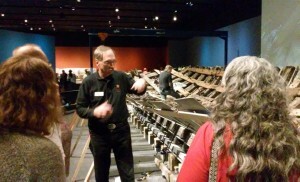 Recently members of the TARL staff were treated to an “insiders’ tour” of the La Belle Shipwreck exhibit at the Bullock Texas State History Museum. In addition to seeing the colorful 4D film, Shipwrecked, loaded with the Bullock’s special sensory effects, we were given a close-up look of the ship’s hull as the massive reconstruction project continues. 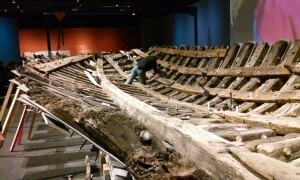 Conservator Peter Fix works on the ship’s hull. Photo by Rosario Casarez. We were fortunate to see this part of the exhibit before it moves to its final resting place at the museum. 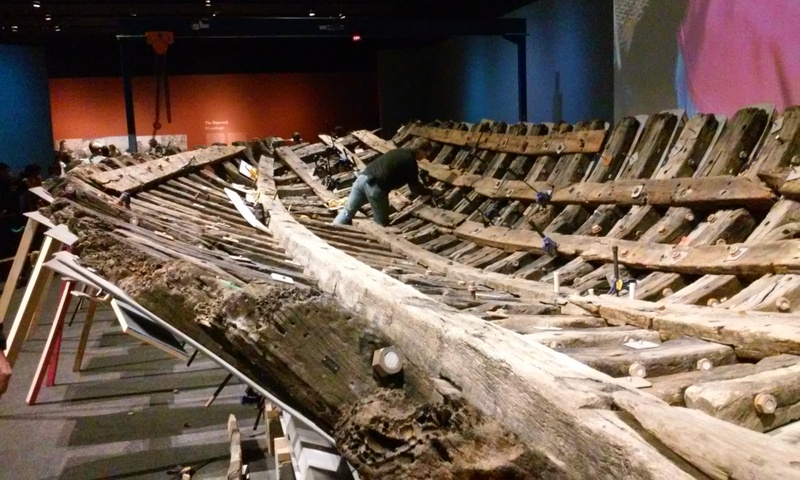 The rebuilt remains of the ship and more than 40 original artifacts will be on display beginning August 8, 2015. Ultimately, museum visitors will be able to walk across a plexi-glass platform and look down into the hull. Special thanks to Jim Bruseth, who directed the years-long archeological project for the Texas Historical Commission and who now serves as curator of the exhibit, for coordinating this enjoyable and very educational outing. Dr. Jim Bruseth, who directed shipwreck investigations, provides fascinating insights about the ship’s hull to members of TARL staff as restorers continue the reconstruction process. The ship was originally intended to be brought to the New World in pieces and reconstructed on site to go up the Mississippi River. Photo by Rosario Casarez. Bruseth, along with Jeff Durst, Donny Hamilton, and historian Robert Weddle, also worked with us several years ago to create the exceptional online exhibits on La Belle and Fort St. Louis for Texas Beyond History. These multi-section exhibits provide detailed information on La Salle and the French in Texas, the events leading up to the small colony’s destruction, and the circumstances of their discovery and archeological investigations. In addition to galleries of artifacts from both the shipwreck and the site of the little “fort” in Victoria County, and full accounts of excavations at both sites, there is a special online viewing tool to explore the shipwreck and discover the artifacts just as the archeologists found them. If you are not able to visit the Bullock, be sure to visit the online exhibits on TBH—or better yet, visit both! Detail of one of the ship’s timbers, showing original Roman numerals identifying its intended position on the ship. 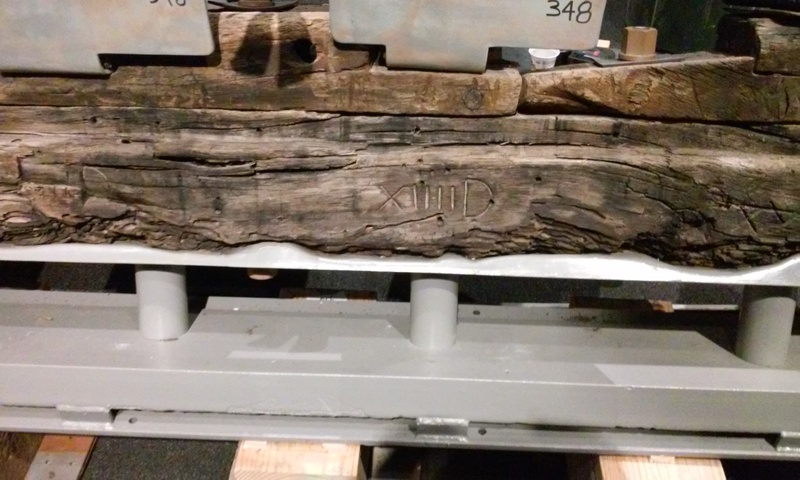 Because the ship was purchased by La Salle as a “kit”, each of the pieces were marked for easy assembly. Photo by Rosario Casarez.